The new edition of Tubeworker, an industrial bulletin for London Underground workers, by London Underground workers. This edition urges RMT members, reps, and activists to argue for their union to press ahead with planned strikes, and urges TSSA, Aslef, and Unite members to argue for the reinstatement of action. It also includes an article on Tory mayoral hopeful Zak Goldsmith's plan to ban Tube strikes, our regular "cleaners' column", plus your local and workplace stories. This issue includes articles on the Leytonstone attack, the ongoing fight against cuts to staffing levels, and cleaners facing short payment and immigration raids, plus your local and workplace stories. This issue includes an article responding to Daesh's terrorist attacks in Paris and elsewhere, as well as local and workplace stories. The latest issue of Tubeworker, an industrial bulletin by London Underground workers, for London Underground workers. This edition contains articles on how to organise in Labour after Jeremy Corbyn's election as leader, the ongoing fight against the anti-union laws, the latest on the LU disputes, as well as your local and workplace stories. The latest edition of Tubeworker, an industrial bulletin by London Underground workers, for London Underground workers. This edition contains articles on the fight against the anti-union laws and celebrating Jeremy Corbyn's election as Labour leader, as well as your local and workplace stories. A special edition of Tubeworker, an industrial bulletin for London Underground workers, by London Underground workers, produced for the RMT reps' meeting on 15 September. This issue argues for RMT, TSSA, and Unite to press ahead with planned strike action, and appeals to Aslef drivers not to cross picket lines. Plus your local and workplace stories. This issue includes articles on the ongoing LU dispute over Night Tube, Jeremy Corbyn's campaign for Labour leader, the regular "cleaners' column", plus your local and workplace stories. A special edition of Tubeworker, a bulletin for London Underground workers, by London Underground workers, for the 8-9 July strike. 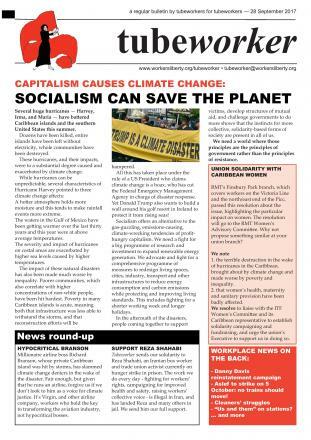 This issue discusses the upcoming strikes, as well as your local and workplace stories.